Nascow Stockyard | CowParade New Figurines | One Price Low Flat Shipping! From the CowParade Retired Medium Cows Collection, Nascow Stockyard. Designed by artist, Charlie Prodrebarac. Displayed at CowParade Kansas City 2001 exhibit. 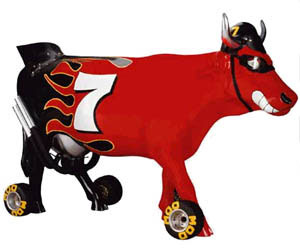 Measures 4" x 6"
This hilarious flaming red cow is dressed like a nascar driver with wheels on its back feet and a tail pipe to boot!